Summer hours at Seward County Community College begin Monday, May 14, with campus open 7 a.m. to 6 p.m. Monday through Thursday, and closed Friday. The summer schedule continues through July 27. Streamlined hours were started several years ago as a way to conserve energy costs, and it worked out well, according to the executive team. The schedule also provides a little “breathing room” for larger, on-campus projects like improvements to the Greenhouse Gymnasium, landscaping and concrete work, and more. * The Industrial Technology Campus, located at 2202 N. Kansas Ave., will remain open for two additional Fridays, May 18 and May 25. Along with the Industrial Technology division office, the location houses the Kansas Small Business Development office, and the SCCC Business & Industry office. The Epworth Allied Health building, located at 303 N. Washington Ave., will observe the same summer hours schedule as main campus. The Colvin Adult Learning Center, located at 930 N. Kansas Ave., will operate through the summer, following the same schedule as the SCCC main campus. 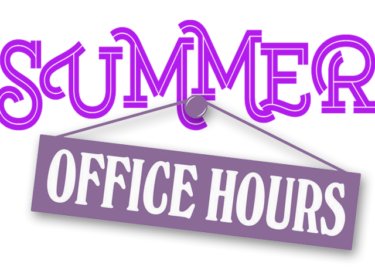 However, its summer office hours will not move to 7 a.m. start time until the week of May 21. The SCCC Wellness Center will continue its normal hours of operation throughout the summer. The center, located in the Student Union building on campus, is open 6 a.m. to 8 p.m. Monday through Friday, and from 10 a.m. to 2 p.m. on Saturday. Pool hours for the month of May only will be 6 to 10 a.m., noon to 2 p.m., and 4 to 8 p.m. Monday through Friday. Special hours for pool during the months of June and July will be announced at a later date. Regular hours at all campus locations will resume on Monday, July 30, 2018 at 7:45 a.m.